This fantastic studio apartment is on the fifth floor of the Angket Condo; being fully furnished it is ready for you to move in now. The kitchen area is very modern and of a European style. It is fully equipped with utensils, pots, pans, cutlery, crockery etc; as well as having an electric hob, extractor fan, hot water kettle, toaster, microwave and refrigerator. The amply sized living / sleeping area has a double bed, good storage facilities, including a large wardrobe and display units. There is also a large corner sofa, coffee table, a flat screen TV with DVD player and a dining table with chairs. The bathroom, which is fully tiled, has been designed and completed to a high standard, features a large worktop housing a large basin and storage space; there is a large walk in shower. There is a lovely corner balcony, accessed via large sliding doors, and includes balcony furniture, providing you with a fantastic place to relax. The apartment also benefits from a feature ceiling with concealed dimmer lighting, as well as curtains, down-lighting, air conditioning and tiled flooring throughout. Angket Hip Residence is just 750 meters from Jomtien Beach, a short ride in the complex's shuttle service (or a 10 minute walk). Jomtien offers plenty of restaurants, shops, bars and water sports along its 6 km beautiful sandy beach. The complex offers residents a range of facilities, including 24 hour security, key card access, laundry service, high speed internet, a fitness center and a communal swimming pool, including a splash pool for children to enjoy safely. There is also a spa offering a range of relaxation treatments and massages, an air-conditioned club house and a coffee shop. The complex has a modern feel throughout and boasts a new and stylish reception area. You could Rent to Buy – Easy payment plans available, no credit check needed. 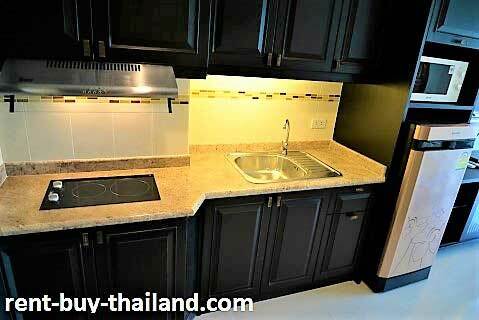 Other Condo for sale or condos for rent Pattaya, Jomtien areas available, please inquire for further details. Buy condo Thailand with flexible payment plans in small easy payments to own your condo.